Earlier this year the city of Atlanta launched the Atlanta City Design Project. Under the direction of Tim Keane, Commissioner of the Department of Planning and Community Development, this project will envision what Atlanta should look like decades from now. It will also inform all future decisions on the growth and development of the city. Atlanta BeltLine visionary and Sixpitch founder and principal Ryan Gravel addresses the crowd at an Atlanta City Design Project meeting held recently at the Central Library auditorium. Commissioner Keane is quick to point out that the city already has plans – lots of plans. The problem is that it’s hard to know what we want Atlanta to become by looking at the many overlapping, intersecting and sometimes conflicting plans. 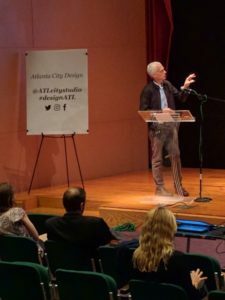 The city has hired Ryan Gravel to drive and guide the project; his 1999 master’s thesis was the genesis of the Atlanta BeltLine and he currently heads up Sixpitch an urban design and planning consultancy. Atlanta is going to change – not changing is not an option – our change will involve significant growth – if properly designed, that growth can be a powerful tool for shaping the Atlanta we want to become. More people are better than fewer – a diverse population is better than a homogeneous one – the most strategic scenario for growth includes everyone. Up front Tim Keane will tell you that this effort is not just about planning and design. It is also about people. There must be vehicles for Atlanta residents to interact with and provide input to the team. The Atlanta City Studio is one such vehicle. Currently housed in donated space at Ponce City Market and open Tuesday – Friday from 10 am until 8 pm and on Saturdays from 11 am until 7 pm, the studio hosts rotating exhibits about neighborhoods and innovative technology. The staff also hosts workshops on a variety of design and planning subjects. Visit the Atlanta City Studio Facebook page for more information and consider dropping into the studio to learn more whenever they are open. In addition, discussions are being hosted for residents to hear presentations, ask questions and provide input. So far three events have been held, all at the downtown Central Atlanta Library auditorium. The first, convened in early September, addressed projected growth in the city. The first question might be, “how big can Atlanta be”? To answer that, Tim Keane brought in Dr. Arthur Nelson. Nelson is a Professor of urban planning at the University of Arizona. He also has deep roots in Atlanta as a former Georgia Tech professor. Looking at projected growth of the metro area, and the shifting preference to live in the city versus the suburbs, Dr. Nelson predicts that our current population of about 465,000 residents will grow to approximately 1.3 million by 2050. Even more importantly, he identified a reduction of 4.5 persons per household in 1950 to 2.5 persons per household in 2010. This means the number of housing units required for this population is also growing. Dr. Nelson’s presentation can be viewed here. We can increase density and support that density with transit, jobs, and amenities while still preserving one of the things that makes Atlanta special – our neighborhoods. Neighborhoods can see slight growth, but the majority should occur “in between”, along the central corridors of the city. These corridors radiate out from the central core of Downtown, Midtown, and Buckhead and are natural boundaries between neighborhoods or groups of neighborhoods. From the north right around the clock face we see Peachtree/Roswell, Piedmont, Ponce de Leon, DeKalb, Memorial, McDonough, Jonesboro, Metropolitan, Lee/Murphy/Campbellton, MLK, Boone, Hollowell, Marietta/Perry, and Howell Mill. To that list we must, of course, add the Atlanta BeltLine. 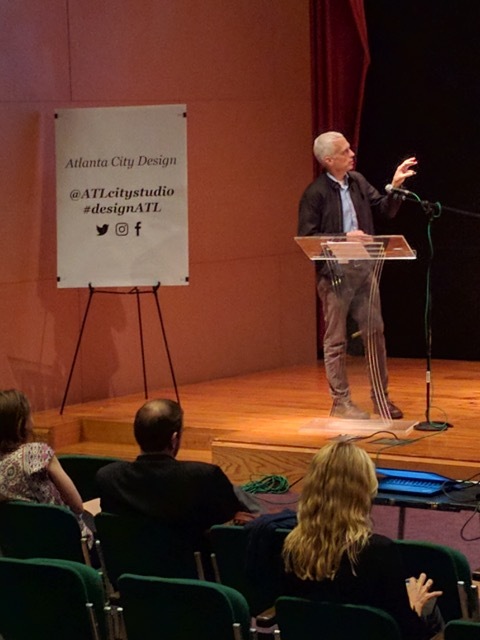 In early October, Ryan Gravel presented the framework for the Atlanta City Design. He told us that the design is not a plan so much as an aspiration that will tie together many plans. The goal is to figure out what is special about this place. Gravel suggests we “capture those things, and embed them in all decisions we make about how the city gets built out over time, so that the city becomes more of what Atlanta is instead of less.” To manage the growth that is coming and still retain the essence of who we are as a city, the team has defined a set of five core values: Nature, Access, Ambition, Progress and Equity. You can learn more from Gravel’s full presentation. Meeting attendees participated in a “Design a Smarter Atlanta” workshop at the Studio in October. 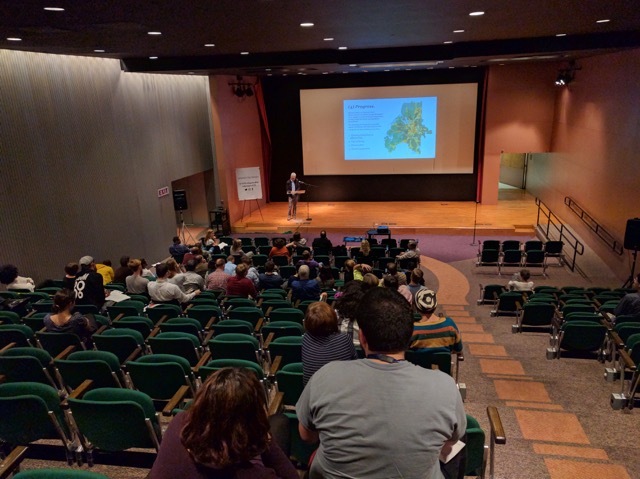 Citizens are being asked “What are your design recommendations to improve the future of our city?” On November 3rd, Commission Kean and Ryan Gravel hosted the third city-wide conversation. The audience was asked for their ideas about each of the five core values. You can add your ideas on the notes section of the Atlanta City Studio Facebook page; in person at the Studio at Ponce City Market Suite N220; or at upcoming meetings which will be announced on Facebook. The Atlanta City Design project will cause intentional shaping of our city. It will not only inform changes to zoning code, Neighborhood Planning Units (NPU) and other planning functions, but will reach into every department from Watershed Management and Public Works, to Parks & Recreation. 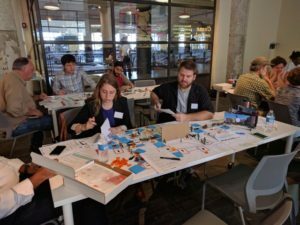 The design will also engage non-profit and private organizations that already are pursuing change initiatives – for example Trees Atlanta’s initiatives to increase our tree canopy. Don’t miss your opportunity to be heard! Make sure that Atlanta is a place we want to live for generations to come.